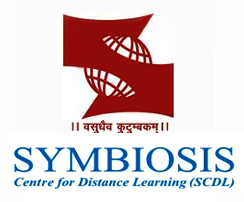 Symbiosis center for distance learning (SCDL) is located in pune (Main office),Bangalore, Nasik and Noida. Symbiosis center for distance learning(SCDL) was established in 2001, Since then it has made a rapid progress in the field of distance education. In its journey of more than 14 years it has offered education to thousands of student in abroad and India.Today SCDL has over 1 lakh active students from 48 countries. students are getting their education through SCDL from countries like India, US,UK,Singapore, Japan, Middle East,Germany,Russia and many more. SCDL offers various courses such as diploma, post graduate diploma & certificate programs in industry sectors i.e international business,business management, information technology, banking and finance,customer relationship management, insurance management, education management, supply chain management & entrepreneurship development. SCDL was ranked 1st in top distance learning institutes and also has won the Maharashtra government's IT award for human resource development through quality distance education and innovative use of ICT. This award was given by Hon'ble chief minister of Maharashtra. Outlook ranked SCDL 8th best distance learning institute in India. It was also nominated by the prestigious international council for distance education(ICDE) for the Institutional Excellence, an apex body promoting open and distance education in the world. SCDL offers the corporate programs with local,national & international organisation including IBM, Cognizant, Infosys, Wipro, Ranbaxy, aditya birla, Wallmart,Vodafone,Collabera, Bharti retail Pvt.Ltd., Cipla and many more who have collaborated with symbiosis to offer the corporate programs. The post graduate diploma in human resource management offered by SCDL helps students to become a better HR professional and improve their knowledge and skills as per latest HR practices & trends. Under this programme the students of SCDL learn basic functions i.e planning & organizing, compensation management and performance appraisal.This program also offer topics such as accounting,economics & many others which are important for students in decision making,strategic planning, motivation of staff and analysis of conflicts in an organisation. This program ensure that the students learn all the aspects of human resource management. After completing this programme someone get various career opportunities such as Senior HR Officer, HR Officer, Placement Officer, HR Consultant, Administrative Head, Recruitment Coordinator, Recruiter, HR Manager, Training and Development Officer, Learning and Development officer etc. The duration of post graduate diploma in human resource management is one year. The ragistration of the participant is valid for two years. Candidate should be graduate in any discipline from a recognized university. International/SAARC students having a graduate degree from a recognized/accredited university/institution. Appearing students for the final year of graduation can also apply. Student can purchase the prospectus and application form for Rs.1200/-(by cash) from SCDL campus and Rs.1100/-(by online) from GO GREEN option and also purchase Rs. 1300/-(hard copy from the post). Student can also purchase prospectus from select axis bank branches and symbiosis pune campus. Now fill up the application form completely and attach required document as prescribed in the prospectus and send it to SCDL main campus along with Registration Fee of Rs 1000. Now submit Full Fee or First Payment Installment along with the Registration Form. Student can also submit the fees via Demand Draft in favor of 'The Director, SCDL Pune' payable at Pune. For SAARC Students: USD 75 OR Rs. 4875/-. A) Option 1 - One Time Payment:- Student can pay the full course fees in one time payment. Student can pay the fee Online or in Cash or via Demand Draft. Payment is acceptable via cash only at SCDL Pune Campus.